L_R: SODELPA awareness manager, Jale Baba and Unity Fiji Party leader, Savenaca Narube. 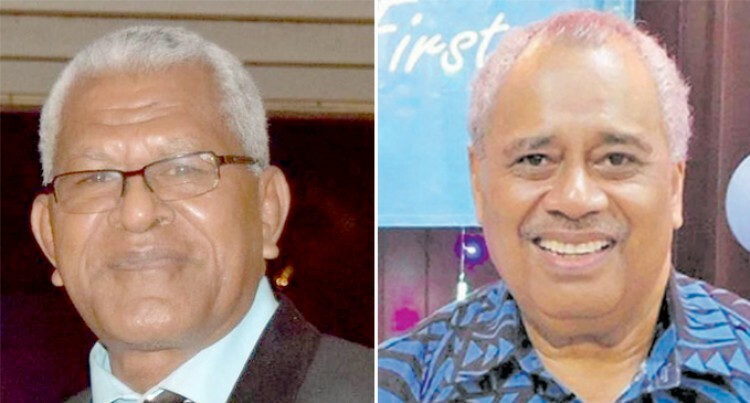 The exchange between SODELPA and Unity Fiji underscores the tension that will intensify between the large and small parties before the 2018 general election. Unity Fiji Party leader Savenaca Narube and SODELPA’s Awareness Manager Jale Baba have traded verbal blows. Mr Baba warned Yako villagers in Nadi to beware of small parties because they confused people. But Mr Narube said the voters would decide the outcome of the election, not the politicians. The competition for votes will fragment the electorate. Research shows that one dimension of political party systems is fragmentation – the degree to which votes are scattered across minor parties. Fragmentation relates to the number of political parties competing in an election and to the willingness of voters to vote for them. It can be a concern because it can affect the stability of governments and their ability to govern. Under the Fijian electoral law, the small parties must get five per cent of the total votes cast to qualify for seats. That’s a high threshold given the size of our electoral landscape. In many countries that have a similar electoral system like proportional representation the threshold is lower between 1.5 per cent and 2.5 per cent. The lower threshold gives rise to a proliferation of small parties. It can lead to difficulties for one party getting an outright majority. It opens the door to coalitions which can be very messy. The high threshold gives that stability to the process. Because this is the second general election, there will be a lot of movement of voters across parties. This could continue into the third general election and even beyond before it reaches an equilibrium – when voters become settled with their respective parties. Mr Baba sounds desperate telling voters not to bother about the small parties – they may not achieve the five per cent threshold. But we cannot completely rule out the small parties from reaching the threshold although recent public opinion polls show otherwise. The small parties could hold the balance of power just as Winston Peters, the New Zealand First leader, did in the NZ elections. In the existing election framework this can happen. In the last election among the smaller parties, the NFP won three seats after winning 5.45 per cent of the votes cast. 500,078 voted out of the 591,000 registered voters. The People’s Democratic Party scored 3.20 per cent and Fiji Labour Party got 2.35 per cent, One Fiji Party got 1.18 per cent, and Fiji United Freedom Party had 0.22 per cent. Independent Rashika Deo got 0.21 per cent. In this election more than 631,000 voters have been registered so far. HOPE is the latest party to join the race. More voters are expected to register. So there are more votes to go around for all parties.